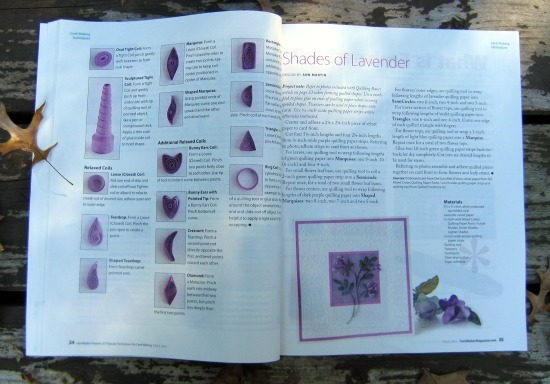 A couple of years ago I did a Quilling Basics article for CardMaker Magazine. 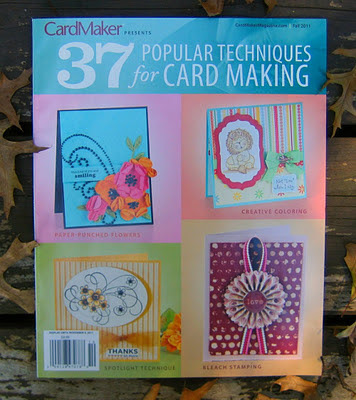 The editor contacted me last summer about a special issue of card making techniques that was being compiled, to ask if I would send in a new pattern to supplement the original article. I submitted this floral design which is affixed to one of my favorite pre-embossed card blanks from DCWV. Because the coils are quite small, it's not a quilling pattern I would necessarily recommend for beginners, but with the information provided in the article, it's one that could be built up to with practice. 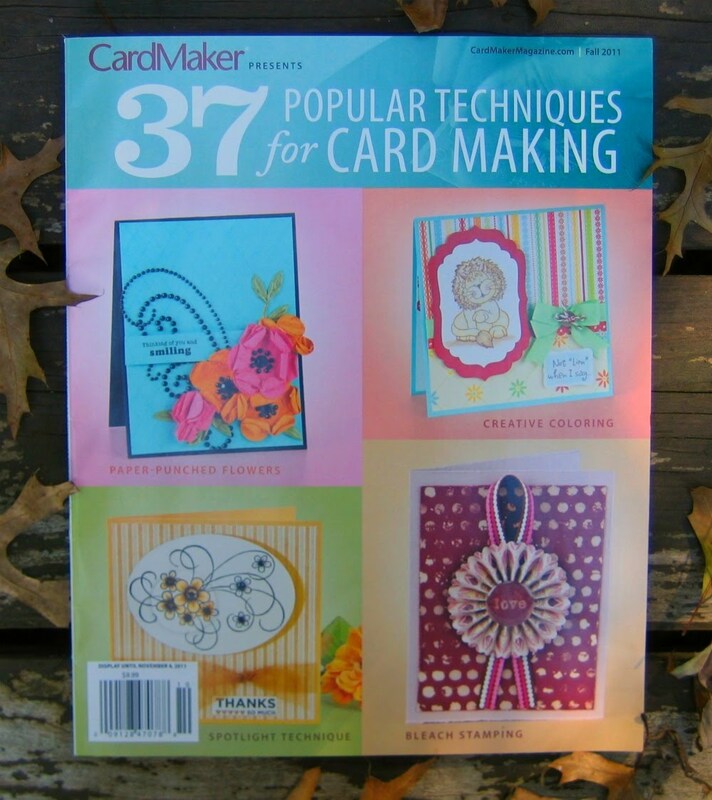 The 37 Popular Techniques for Card Making - Fall issue - is now available from Annie's Attic as a digital download or as a print copy. Hi there. I was one of the 2 guys that created these images and would just like to say thanks for the kind words. For those of you that are interested in how they were made, firstly Paul (one of our designers) created the flat vector in Adobe Illustrator using the work of the amazing Yulia Brodskaya as a point of reference (http://www.artyulia.com/). If anyone is interested in a more in-depth process, let us know at beobserved and we could do a tutorial. This is another digital example created by The Observatory for an exclusive events company. Really lovely, I think. The digital quilling is beautiful. But not as beautiful as your quilling, which is so very perfect. I am in awe of both methods of quilling! I'll bed that your overlapping coils would be a feat for the digital quillers, though... :)and so gorgeous! Wonderful work. The room for both hand- and digital quilling is spacious! I was VERY interested to see this post about digital quilling, as I missed the original one you posted in September while I was away on vacation. I have dabbled a bit with digital quilling processes myself (see below), and am convinced that there is a place for it, both as an aid to designing quilling patterns and as a complementary art form that helps to promote and enhance traditional hands-on quilling. One of the people who commented on your earlier post said: "Although I love paper crafting, I have been going to digital scrapbooking more and more just for the cost and space savings. I would love to find a digital quilling set that really worked. someone that would make the individual shapes, so that I can color them and put them together the way I want them. If anyone knows of a good kit like this, let me know." Anyone thinking along similar lines might be interested to check out my site http://coilsbyquilliance.blogspot.com where they might just find exactly what they are looking for!! My own version of digital quilling is based on conventional quilled shapes (teardrop, marquise, tight circle etc) which can be coloured, re-sized and assembled on-screen just as you would do with hand-made quilled pieces. It's never going to be as beautiful or versatile as the real thing, but digital quilling is brilliant for creating a layered quilled effect on a flat printed surface, and also for printing out quilled designs in bulk (e.g. for multiple packs of Christmas cards). I was fascinated to read the reactions to your original post, and will also follow this one with interest. Thank you, Ann! 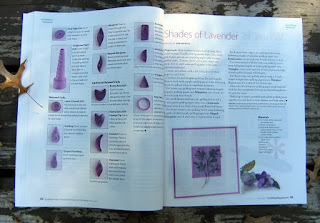 I saw your design in the Card Maker magazine the other day! It is very pretty, and I love the color! your design is very pretty. I like it. That digital quilling is fascinating. interesting to get the feedback on how the digital quilling evolved; nice post. Your card; I like having the embossed background; it really sets off the quilling or rather I should say it compliments your lovely quilling. Lovely card! I like the graceful stems and the way you stacked the petals to give it another dimension. The digital quillings is prachtig.ik love it! hi ann!! looks like you hit upon a very trendy topic with the digital quilling. i think it's gorgeous, i love that yulia was the inspiration for the designs! she's so amazing. Your quilling is so precise and perfectly neat! I am not too happy about the digital quilling taking off. I guess I love paper too much. For me it'll do what e-mail did to letter writing. The only upside I see is that it brings attention to this age old art. Maybe I'm just a old fashioned modern kinda girl? Your card is very pretty. Great job on always getting the word out. Quilling really owes you, Ann! Thanks for your comments everyone. Philippa, I'm glad you posted your website link - your digital coils sound intriguing. Sandy, that's so kind of you to say, but the way I see it, all of us who share pictures of our work online are a collective force in getting the word out about quilling.